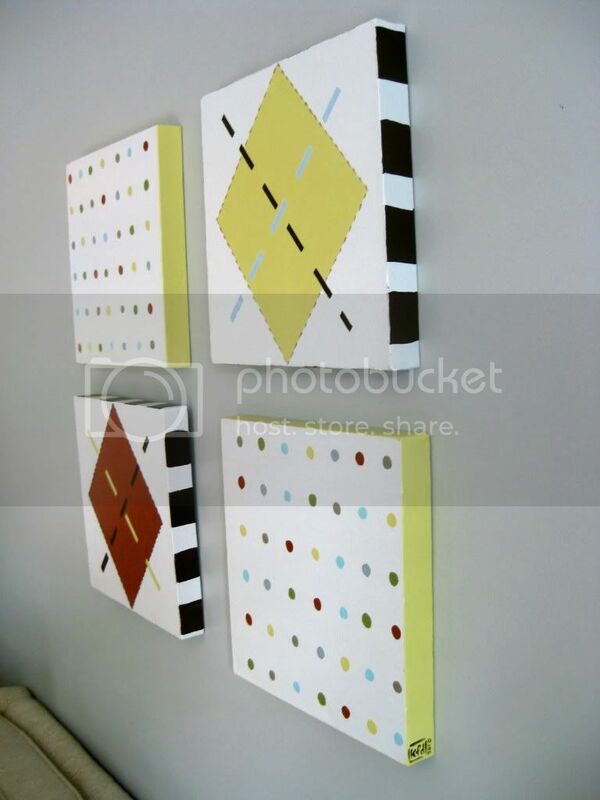 Kristen F. Davis Designs: client nursery work! a few months ago, i did some furniture painting for a client with a baby on the way. 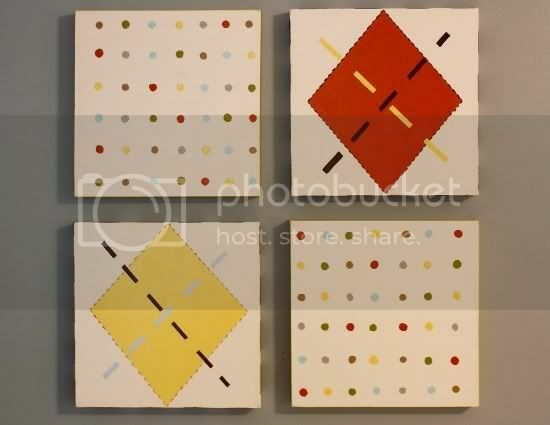 last week, she contacted me to do 4 smallish canvases for one wall. here is everything! 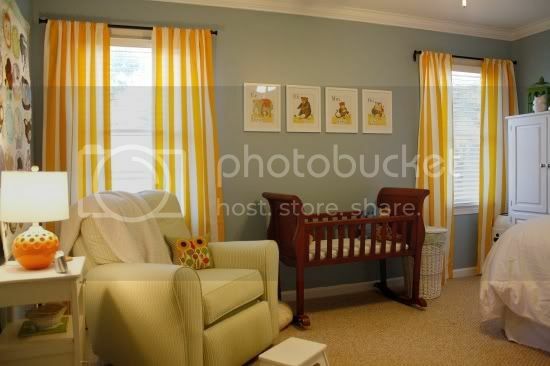 i love how the nursery turned out - great work, rianna! 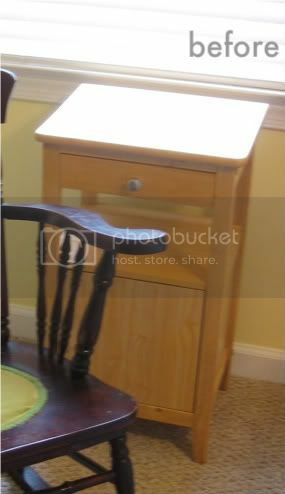 i painted the little side table, and rianna added new hardware. it has a new life! don't you love the quilt (it's from "the land of nod")? i also love the cute orange lamp in this photo! here is the whole room. rianna's mom made those great yellow-and-white striped curtains with fabric from ikea. my kind of project! i love them. they really add so much whimsy to the room! here is the wardrobe before i painted it - it had a pretty drastic makeover. it used to be warm, knotty wood, and i brought in smooth, creamy white paint and gave it a light distressing (similar to the distressed pottery barn furniture). 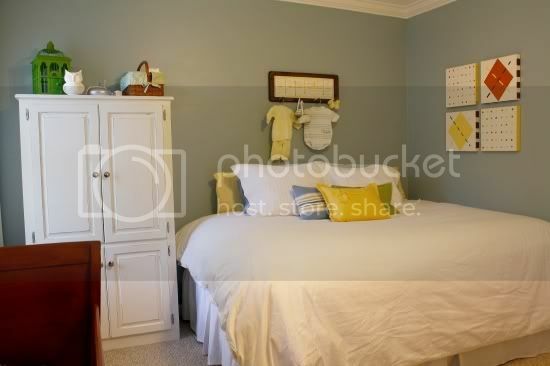 this also shows the room color "before", and the many choices of blue on the wall! dont you love the owl that sits on top? 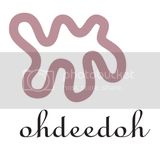 he is from "fruitfly pie", which is one of my favorite etsy shops! i also adore the kelly green birdcage. 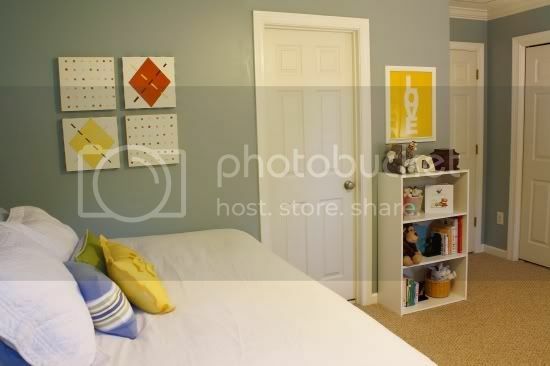 here is that entire side of the room, and to the right, you can see the 4 square custom canvases i did for the nursery. i pulled in patterns from the sheets and bumper that go with the bedding set. i like how rianna hung baby clothes above the bed! the "love" print is from madebygirl - a great blog (and she has an etsy shop with wonderful prints). so, that concludes our tour! isn't it a sweet nursery? The canvases are great, love the difference on the armiore, wow. Aren't nursery's and kid's rooms the most fun to decorate?! Gorgeous nursery! nice work! the armoire and the paintings are great. and the rest of the furnishings and accessories are so cute! very inspiring. So cute! I saw a little bit of that green and brown rocker you painted white. 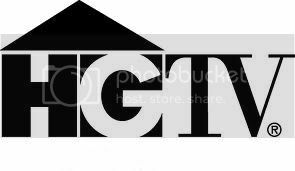 Where is that at now? I don't see it in the room. Also, I saw this site once where this woman took old newborn christening outfits and lacy white onesies and dresses and strung them through the arms on a curtain rod and used them for a half curtain. 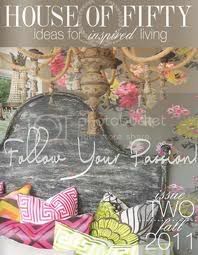 Soooo shabby chic and interesting! 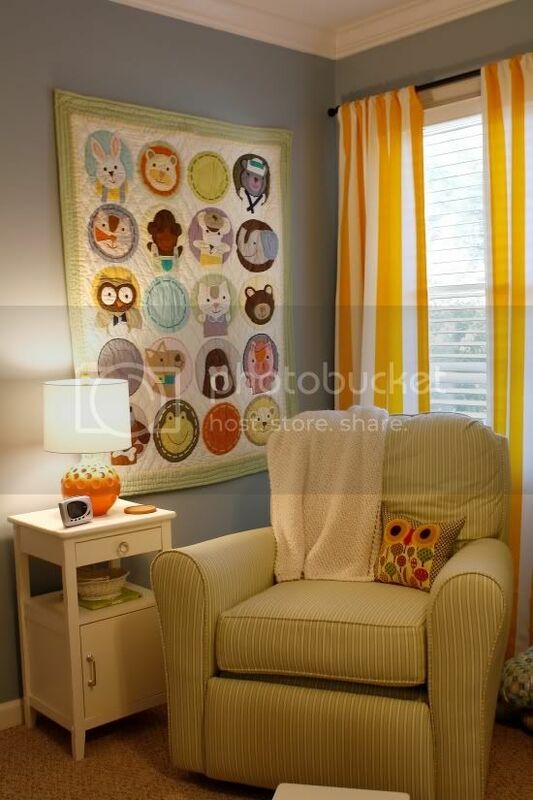 This is the perfect nursery! Not too baby-ish, not too grown up. Just right. Hi. I totally love your blog. 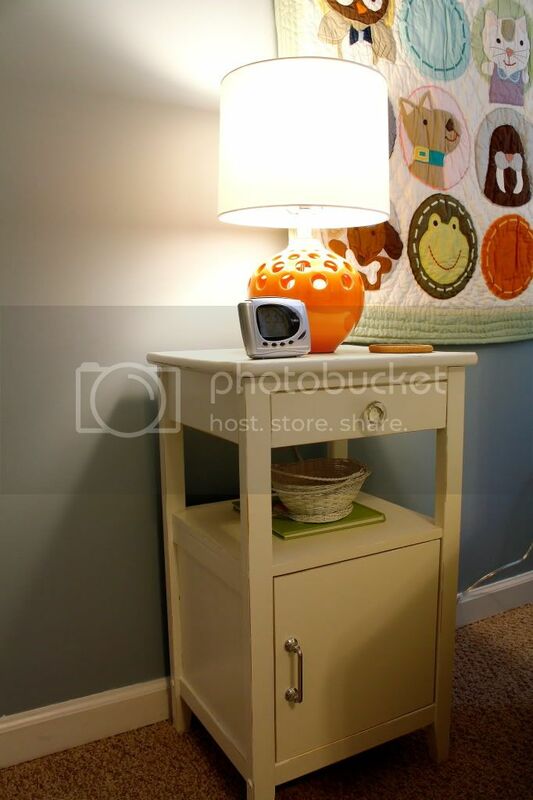 Do you recall where the orange lamp came from in this nursery? thanks! i'm not positive that the homeowner got her's there, but i have definitely seen that lamp at marshalls! Beautiful work! It's amazing what some paint and a vision can do! Wow, great job! 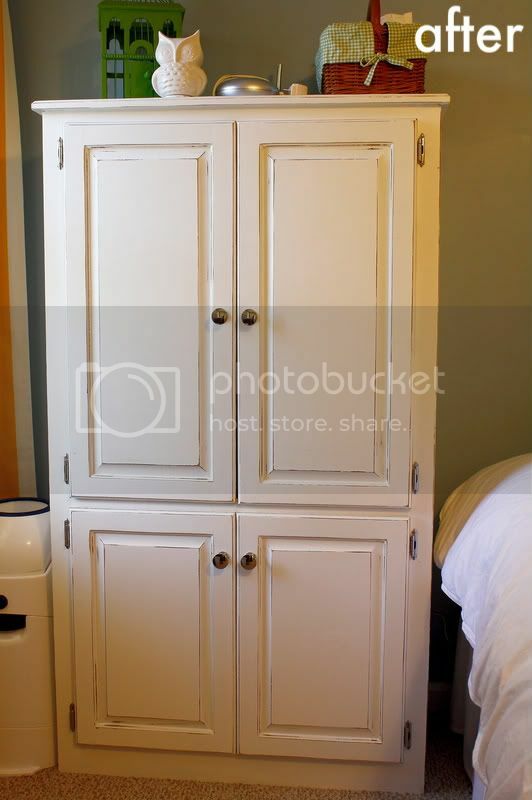 I especially love the armoire makeover. I just purchased a trunk that I want to re-purpose as a table for my son. 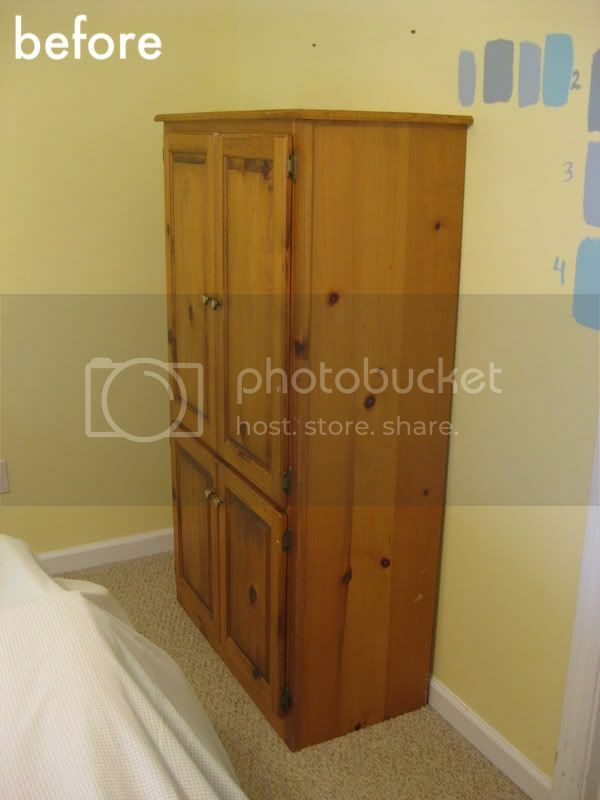 I think the colors you used on the armoire would be perfect. Could you possibly tell what brand/color they are and a little bit more about the process. What is the paint color? I am doing my baby boy's nursery & am looking for a blue/grey tone.